I have a whale bone to pick with the world of history as written by men in relation to what women were capable of doing, knowing, or creating–especially when it’s about clothes. A recent discovery of a medieval bra has overthrown the long-held belief that the bra was invented only about 100 years ago. Really? Just because there hasn’t been material evidence of bras before the torture device called a corset, people can’t fathom the idea that women might have been smart enough to sew fabric in such a way as to support their breasts comfortably? Thank goodness the Victorian Age is over! Mary Phelps Jacob got the first patent for a bra in 1913 when she sewed two silk hankies together to wear under a new evening gown. I can’t blame her for wanting to pitch her stiff, tight, and uncomfortable corset. But that doesn’t mean she invented the brassiere for the first time ever in all of history. Sheesh. Honestly, there are so many bra options on the market now that women can wear anything from the barely-there sheer to the push-up bra. Don’t forget the all-in-one SPANX so no one sees the muffin top at the too-low waistline of our jeans. Oh, no! We’re back to the torture devices again! 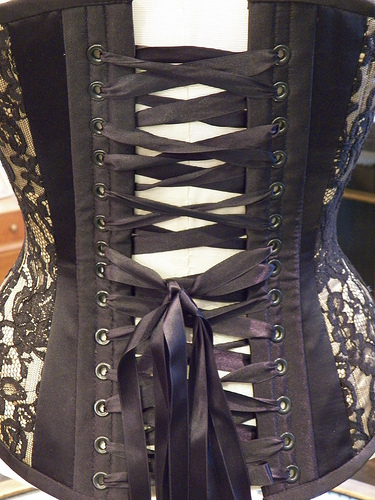 Women, have we learned nothing since the corset was thrown out? In honor of the sometimes-matching partner to the brassiere, check out what Jenny Hansen has to say about the national day for underwear. Do you have a least favorite article of clothing? I’d love to hear from you.